Heritage schemes involve a number of different stakeholders who all have a vested interest in any redevelopment, including the local authority, public bodies such as Historic England as well as the local community. It is vital that M&E contractors engage with the relevant parties at the earliest opportunity to understand their requirements. The building services solution must then be designed in line with their criteria and full approval gained before work begins. To ensure the original fabric of the building is not altered or damaged in any way, electrical and mechanical products have to be carefully selected, including the use of wireless technology if possible. New electrical and security equipment will need to be discretely positioned and services both internally and externally completely concealed. This may involve using existing features to hide service routes or running services through floor voids or the roof space. Energy efficiency is another important consideration, which in many cases requires older buildings to be significantly upgraded with new mechanical equipment, including ventilation. To establish the most appropriate measures, careful planning is needed to assess all factors affecting energy use and the property’s future requirements. The solution will not only have to improve performance and deliver cost savings but ensure there is no harm to the building. 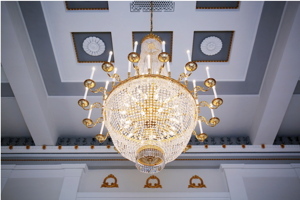 The recent restoration and extension of a Grade II listed Georgian town hall in St Albans city centre highlights the complexities of M&E work in the heritage sector. Located in a conservation area, the historic building was built in 1831 and has been transformed into a new museum and art gallery by main contractor Willmott Dixon. Spanning three floors, the work has seen the ground floor’s entrance halls turned into a reception area and exhibition space. The former Victorian courtroom has been fully restored and on the first floor, the assembly rooms have been refurbished for events including heritage and art exhibitions. A new temperature-controlled and secure lower ground floor gallery has been created under the building for national exhibition and art shows. The ground floor has also been renovated to accommodate a learning studio, new visitor information point, gift shop and café. Designed by architects John McAslan + Partners, the ambitious project had to retain and enhance the building’s historic and listed features but at the same time deliver address 21st century issues. This included a need for a complex building services solution that would significantly improve energy efficiency and future maintenance. The solution also had to meet specific demands in line with its future use, including carefully controlled temperature and humidity to protect the works of art and local historic artefacts, which would be on display. Our role evolved from consultant to designer as we could offer the specialist skills and experience required to deliver the brief. This saw us work with various stakeholders, including the local authority, Historic England and architectural, planning and heritage consultants to develop the design over an eight-month period. Each space was individually modelled and all elements approved including the lighting schemes, heating layout and ventilation. This early engagement ensured the solution met all requirements and could be delivered within the required budget. We continued to work with Historic England throughout the project to ensure its requirements were met during installation. One of the biggest challenges was installing building services into the subterranean basement, which was hand excavated under the building, so it could be converted into a gallery space with toilets. This area was also the location for the new plant room. The brickwork was exposed, the space was damp and there was limited headroom. All services had to be concealed, including the large ventilation ductwork, and we had to meet the demands of future exhibitors such as the V&A and Hayward Gallery. It was essential that temperature and humidity in the space could be carefully controlled to protect exhibits, so the HVAC system design and installation was critical. No penetrations were permitted on the ground floor or throughout the building, so to install the large ductwork, we had to use the existing chimney stacks and create new riser positions with buried ventilation ducts within the basement area. Security was another priority for the exhibitors, so a range of specialist equipment was required such as high-security shutters and intruder alarms that met the requirements of the insurers. Following the successful installation of all services, a new building management system is generating further benefits, reducing maintenance costs and increase the life expectancy of the plant systems. 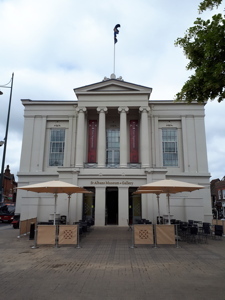 The new £7.75 million St Albans museum and art gallery has welcomed more than 55,000 visitors since it opened in June and during one of the UK’s hottest summers. Despite this, the building services solution has performed very effectively and that’s testament to the early design work and engagement which has ensured all criteria has been met. 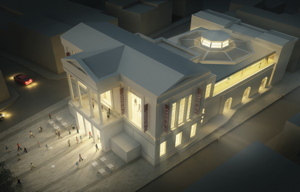 Set to be a world-class centre for arts and culture, the construction project team has helped to give the city’s town hall a new lease of life and enabled historic spaces to be preserved for future generations.